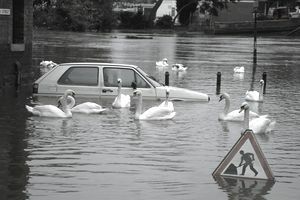 Don't Buy a Flood-Damaged Vehicle! In 2017, Hurricanes Harvey, Irma, and Maria caused severe flooding in Texas, Florida, and Puerto Rico, respectively. During the previous year (2016), the United States experienced 19 separate floods. A single flood can cause millions of dollars in damage to property, including vehicles. Water can wreak havoc on an automobile, particularly its electrical system. It can also damage the engine, the transmission and the cooling system. Moisture that collects in carpet, upholstery and interior liners can generate mold. While some businesses purchase used vehicles, few knowingly buy an auto that has spent time in flood waters. Yet, flood damage can be difficult to identify. In addition, vehicle buyers might not consider flood damage if no recent flooding has occurred in their area. They may not be aware that flood-damaged vehicles are often transported across state lines. Such autos can turn up on used car lots many miles from where a flood occurred. What Happens to Flood-Damaged Autos? How can you avoid buying a water-damaged vehicle? The first step is to understand how such autos may appear in the marketplace. The following scenario demonstrates a typical flood-damage loss. Your company owns a small pickup truck. One day, you drive to your accountant's office to review some tax forms. You park the truck in an underground garage near your accountant's office. While you are meeting with your accountant, a severe thunderstorm blows up. The storm produces heavy rain that causes a flash flood in the parking garage. Your truck is submerged for over a day. By the time you are able to retrieve it your truck is severely damaged. Fortunately, you have insured the vehicle for physical damage under a commercial auto policy. You file a claim with your insurer under comprehensive coverage. Your insurer declares the vehicle a total loss. You sign a release form stating that you have no further claim to the vehicle and your insurer sends you a check for its actual cash value. Once you have signed the release form and received your loss payment, your insurer assumes ownership of the vehicle. The insurer will likely sell the vehicle to a junkyard or parts dealer. Before it can do that, however, it must comply with state notification laws. Most states require insurers to inform the Department of Motor Vehicles (DMV) or other licensing agency that the vehicle has been declared a total loss. The insurer may also be required to obtain a branded title from the DMV. A brand is a designation that describes the vehicle's history. Examples are salvage, junk, rebuilt, revived junk, and lemon law-buyback. Brands differ from state to state. Some states have created a separate brand, such as water-damaged, to identify flood-damaged vehicles. Others assign flood-damaged autos a generic brand like salvage or junk. A brand remains part of the vehicle's title for the remainder of its lifetime. This ensures that potential buyers will be aware of the vehicle's history before purchasing it. In the truck example cited above, suppose that your insurer requests a salvage brand from your state's DMV. The brand becomes part of the truck's title and remains there when ownership of the vehicle passes from the insurer to an auto junkyard. The junkyard strips the vehicles, saves any parts that can be reused, and discards the rest. It then sells the usable parts to retailers or the public. If a flood-damage auto is not insured for physical damage, the owner may be obligated to report the vehicle as salvage to the state DMV. The owner may also be required to surrender the title. If the owner wants to keep the vehicle as salvage, he or she may be required by law to apply for a salvage title from the DMV. Some flood-damaged autos aren't scrapped for parts. Instead, they are purchased by unscrupulous dealers who sell the autos to unsuspecting buyers. Dealers clean the vehicles and make minor repairs in an effort to hide evidence of flood damage. They may also "wash" the titles by moving vehicles to states that use brands other than those attached to the vehicles' titles. For instance, a vehicle branded "water-damaged" in one state is moved to a state that doesn't recognize the "water-damaged" brand. The vehicle is assigned a new title without a brand and is then sold. Suppose you have found a used auto you want to purchase. How can you determine whether it is flood-damaged? The first step is to locate the vehicle identification number (VIN) so you can obtain a vehicle history report. You can order a report online from a provider such as Carfax, Autocheck, or VINcheck. VINcheck is a free service offered by the Nation Insurance Crime Bureau. Another source of vehicle history reports is the National Motor Vehicle Title Information System. The NMVTIS is a national database operated by the federal government. It contains data provided by insurers, junkyards, and state motor vehicle departments. Prospective vehicle buyers can obtain a vehicle history report through a data provider listed on the NMVTIS website.